Cook lasagna noodles to desired doneness as directed on package. Drain. Meanwhile, heat oven to 350°F. In medium saucepan, blend broth and cornstarch until smooth. Add milk and dill weed. Bring to a boil, stirring constantly. Cook over medium heat for 2 to 3 minutes or until white sauce is bubbly and slightly thickened, stirring constantly. Spread 1/2 cup white sauce in bottom of ungreased 13x9-inch (3-quart) glass baking dish. Top with 3 cooked noodles. 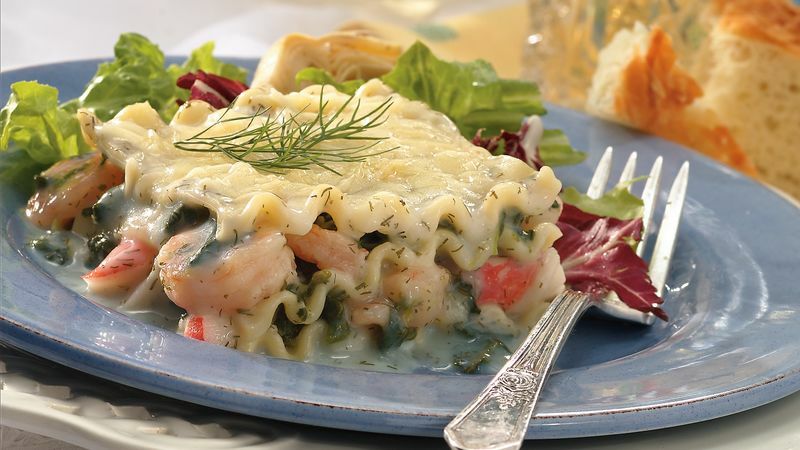 In medium bowl, combine shrimp, spinach and 1 cup of the white sauce; mix well. Spoon half of shrimp mixture over noodles; spread evenly. Sprinkle with 2/3 cup of the Swiss cheese. In another medium bowl, combine crabmeat and 1 cup of the white sauce; mix well. Spoon crabmeat mixture over cheese; spread evenly. Top with 3 noodles. Top with remaining shrimp mixture, 2/3 cup Swiss cheese, remaining noodles and any remaining white sauce. Cover tightly with foil. Bake at 350°F. for 50 to 60 minutes or until hot and bubbly. Remove from oven; uncover dish. Sprinkle with remaining 2/3 cup Swiss cheese and Parmesan cheese. Return to oven; bake an additional 5 to 7 minutes or until cheese is melted. Let stand 10 minutes before serving. Garnish with fresh dill. You can replace the imitation crabmeat with refrigerated or frozen (thawed) real crabmeat for an extra special dinner.